Pocheros usually have saging na saba, and some were cooked with pechay (or bokchoy) and some add carrots too. Since my mom usually cooked it with just cabbage, Baguio bean and saging na saba, I decide to use the same it in this recipe. Also, I did a lazy version of cooking here because I used my slow cooker. Yes, it takes so much time in cooking, but since I didn't do much, I call it lazy way of cooking. 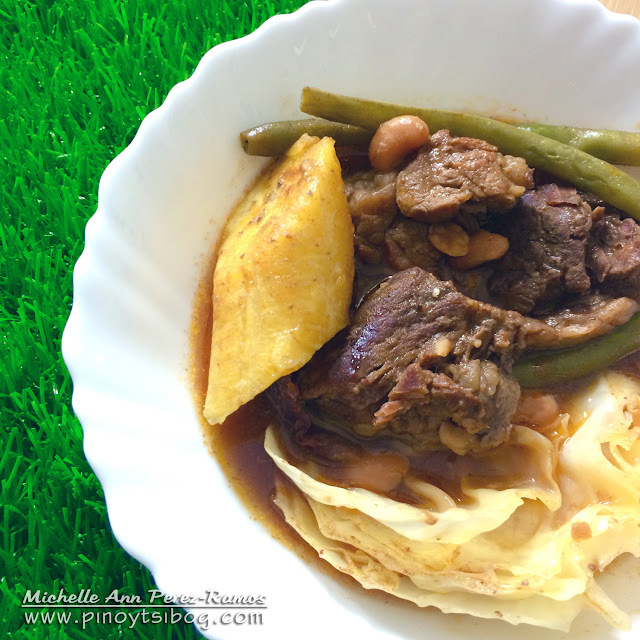 I just love using my slow cooker especially in cooking beef because of the perfect tenderness and flavor it makes to the meat. In a pot, bring 1 cup of water to boil. Add in beef broth cube, garlic, onion, tomato paste, tomato sauce and diluted cornstarch. Let it simmer while stirring until thick. Set aside. Put beef in slow cooker, add 1 cup water, season with salt and ground pepper. Cover the slow cooker and set it on high. Let it cook for 4 hours. Add the pork and beans, cabbage, banana and Baguio beans. Cover and let continue to cook in high for another hour.